Christmas, New House, Move... all in one. We finally moved into our new home (2 year project, whew.) on December 19th. That made for an eventful Christmas. Here's a few pics from our Christmas card shoot. We were all sick (including little Liam), surrounded by moving boxes but we had some great Xmas music in the background - and heck, we even had a mobile Christmas tree to boot. It was still a good time because we laughed a lot at the craziness of our season...and we were a little too excited to move into our new home. 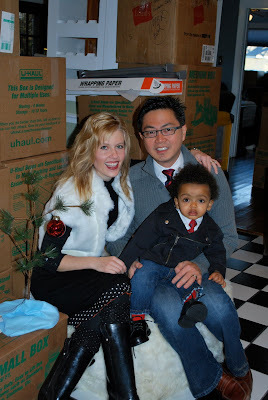 Here's one photo (below) from Christmas 2009. I didn't do so well in catching the moments on film this year. Maybe we will post photos of the finished house project one day....hmmm. Our family came to spend Christmas with us...and they (and our wonderful friends) helped us so much with the move and getting settled in to the new house. They were pretty incredible to help us with all of that during Christmas time.